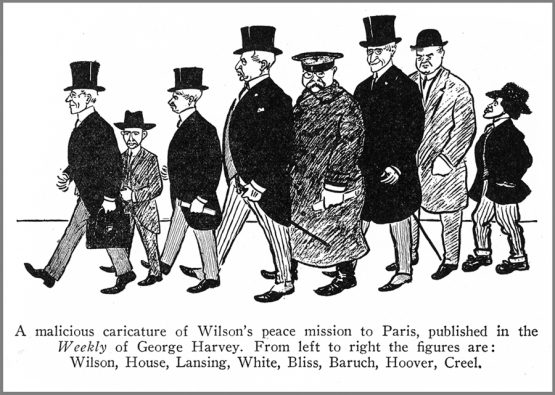 Celebrated columnist Walter Lippmann (1889 - 1974) wrote this piece to mark the end of the Wilson administration (1912 - 1920) and usher-in that of Warren G. Harding (1865 � 1923). "And I firmly believe that the historian who examines the state papers of Wilson up to November, 1918, will say, not only that they are in an unbroken line from Washington's Farewell Address, but that it required something very like genius under the pressure and in the fog of a world war, to keep that line intact." Click here to read about a dream that President Lincoln had, a dream that anticipated his violent death. Franklin Knight Lane (1864 � 1921) recalled his service as President Wilson's Secretary of the Interior and the eventful year of 1917 when Wilson lead the U.S. into it's first European war. Some may be amused as he reminiscences about the time Army Chief of Staff General Tasker H. Bliss (1853 - 1930) fell asleep during one of the cabinet meeting. "There are various reasons for Woodrow Wilson's present pre�minence. For one thing he represented, for years, the rights, under International Law, of the nations which were not in the war, and whatever his private opinions may have been as to an attitude of strict legality....Then, further, he is at the head of a nation which had no selfish motives in coming in. America wants for herself no new territory, no new spheres of influence. France wants Alsace and Lorraine. Italy wants 'Italia Irridenta'. England, though she declared war to save France from being overrun through losing the channel ports, has gained incidentally all German Africa and the German islands of the South Seas..."
"...It must be a peace without victory... Only a peace between equals can last. Only a peace the very principle of which is equality and a common participation in a common benefit. The right state of mind, the right feeling between nations, is as necessary for a lasting peace as is the just settlement of vexed questions of territory or of racial and national allegiance..."
Click here to read a simple list of Wilson's 14 Points.